A subset of pancreatic nerve extensions derives from neurons that were once in close contact with endocrine cells. Whole mount immunostaining at 80 hpf for GFP (elavl3-positive cells), acetylated Tubulin (nerves), Insulin (beta cells), and RFP (delta cells). Yellow arrow points to elavl3 expressing cell projecting neural extensions toward the pancreatic islet. Time-lapse imaging shows detachment of neurons from the pancreatic islet. 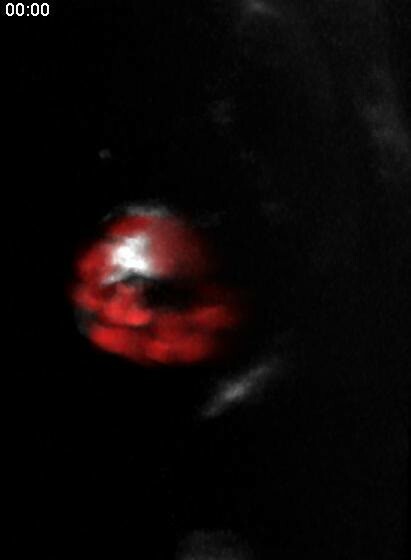 24 hpf Tg(elavl3:Gal4-VP16); Tg(UAS:EGFP-CAAX); Tg(sst2:RFP) zebrafish mounted in 0.5% agarose with tricaine was imaged with laser scanning confocal microscopy at 20 min time intervals. Movie corresponds to Figure 2A. 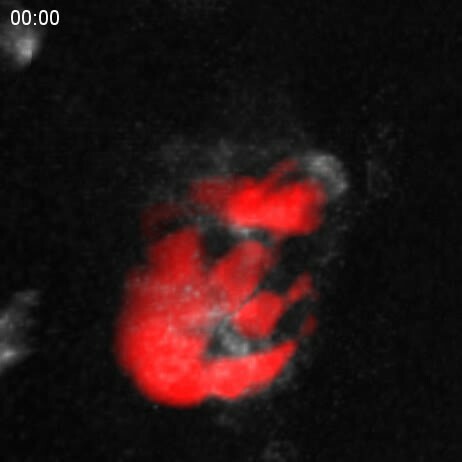 24 hpf Tg(elavl3:Gal4-VP16); Tg(UAS:EGFP-CAAX); Tg(sst2:RFP) zebrafish mounted in 0.5% agarose with tricaine was imaged with laser scanning confocal microscopy at 20 min time intervals. 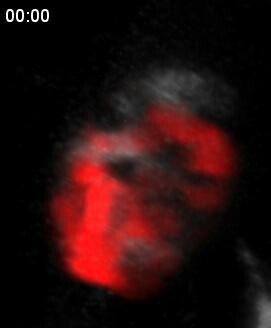 Time-lapse imaging shows neurons migrating away from the pancreatic islet. 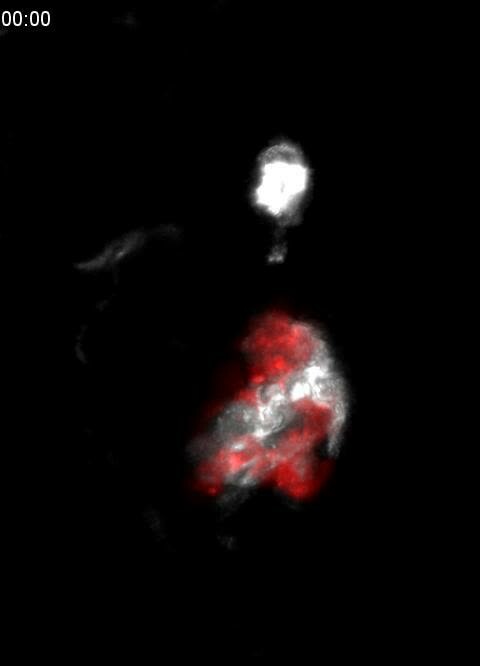 39 hpf Tg(elavl3:Gal4-VP16); Tg(UAS:EGFP-CAAX); Tg(sst2:RFP) zebrafish mounted in 0.5% agarose with tricaine was imaged with laser scanning confocal microscopy at 20 min time intervals. Movie corresponds to Figure 2C. Time-lapse imaging shows vagus nerve extending past the pancreatic islet. 59 hpf Tg(elavl3:Gal4-VP16); Tg(UAS:EGFP-CAAX); Tg(sst2:RFP) zebrafish mounted in 0.5% agarose with tricaine was imaged with laser scanning confocal microscopy at 30 min time intervals. Movie corresponds to Figure 2D. 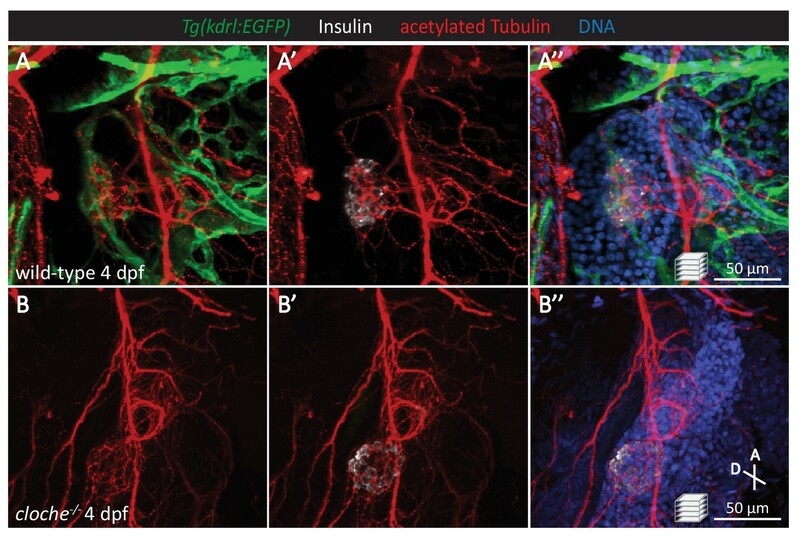 Time-lapse imaging shows neurite extending toward the pancreatic islet. 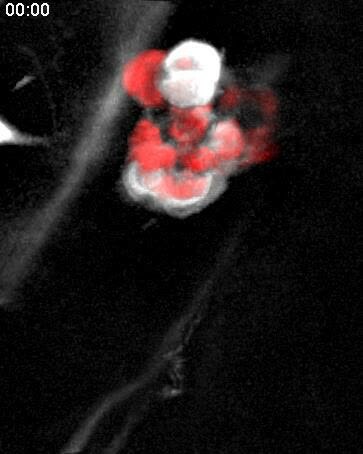 59 hpf Tg(elavl3:Gal4-VP16); Tg(UAS:EGFP-CAAX); Tg(sst2:RFP) zebrafish mounted in 0.5% agarose with tricaine was imaged with laser scanning confocal microscopy at 30 min time intervals. Movie corresponds to Figure 2E. Time-lapse imaging shows interaction of detached neurons with the vagus nerve. 59 hpf Tg(elavl3:Gal4-VP16); Tg(UAS:EGFP-CAAX); Tg(sst2:RFP) zebrafish mounted in 0.5% agarose with tricaine was imaged with laser scanning confocal microscopy at 30 min time intervals. 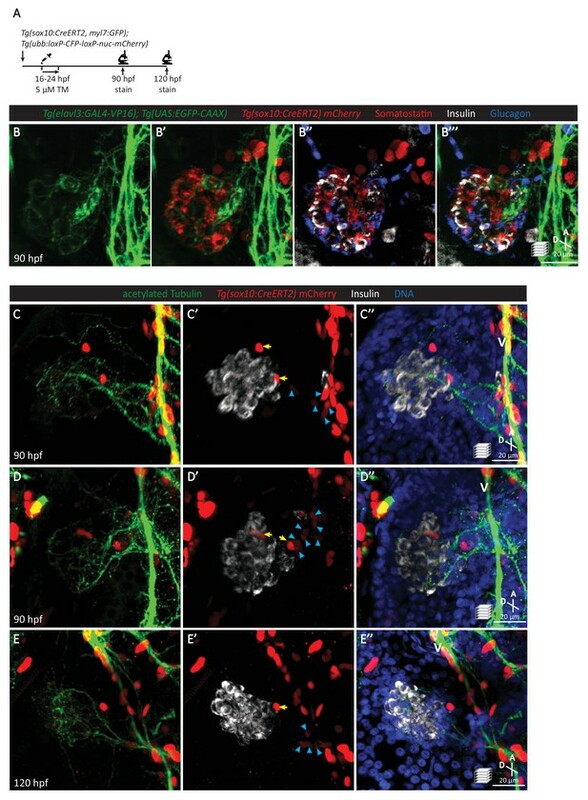 Time-lapse imaging shows detachment and caudal migration of neurons from the pancreatic islet. 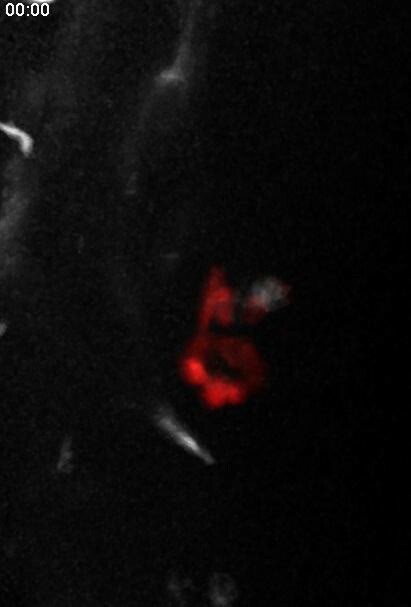 83 hpf Tg(elavl3:Gal4-VP16); Tg(UAS:EGFP-CAAX); Tg(sst2:RFP) zebrafish mounted in 0.5% agarose with tricaine was imaged with laser scanning confocal microscopy at 45 min time intervals. Neural crest cells are essential for the establishment of islet parasympathetic innervation. 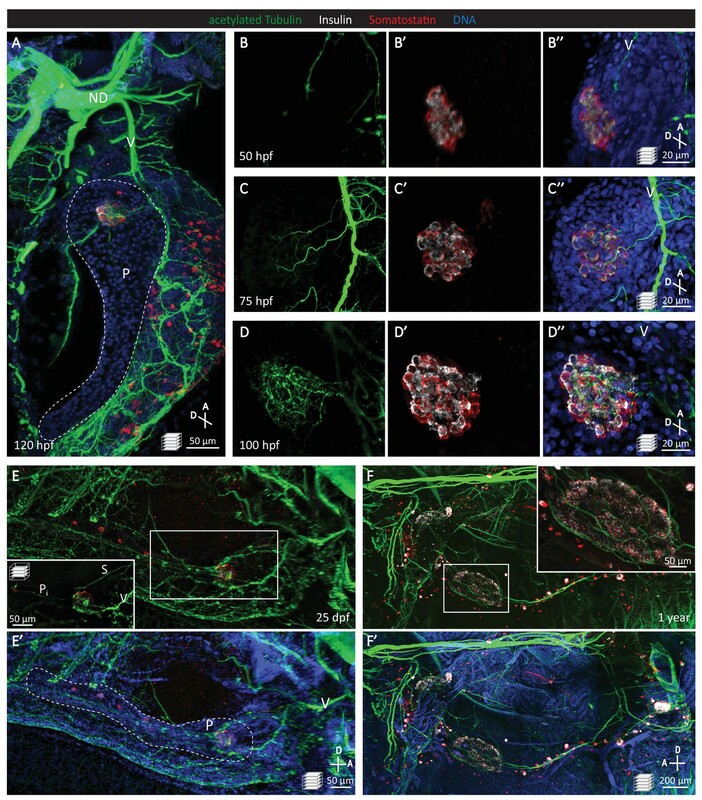 (A) Immunostaining analysis of innervation density in wild-type and sox10 mutants at 80 hpf. 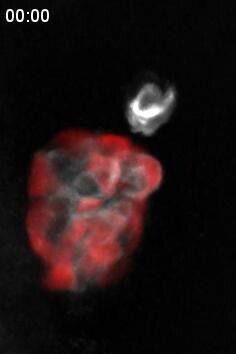 (B) Wild-type and sox10-/- zebrafish at 80 hpf. (C) Body length measurements at 80 hpf, mean ± SEM, n = 26–27 animals, p-values from t tests are presented. (D) Whole larva free glucose level measurements at 80 hpf, mean ± SEM, n = 21–22 batches of five larvae per replicate. (E–F) Whole mount immunostaining at 80 hpf for acetylated Tubulin (nerves), Insulin (beta cells), Somatostatin (delta cells), and DAPI (DNA) of wild-type and sox10 mutants. sox10 mutants display a severe decline in enteric nervous density and a complete loss of pancreatic innervation, n = 8 animals. 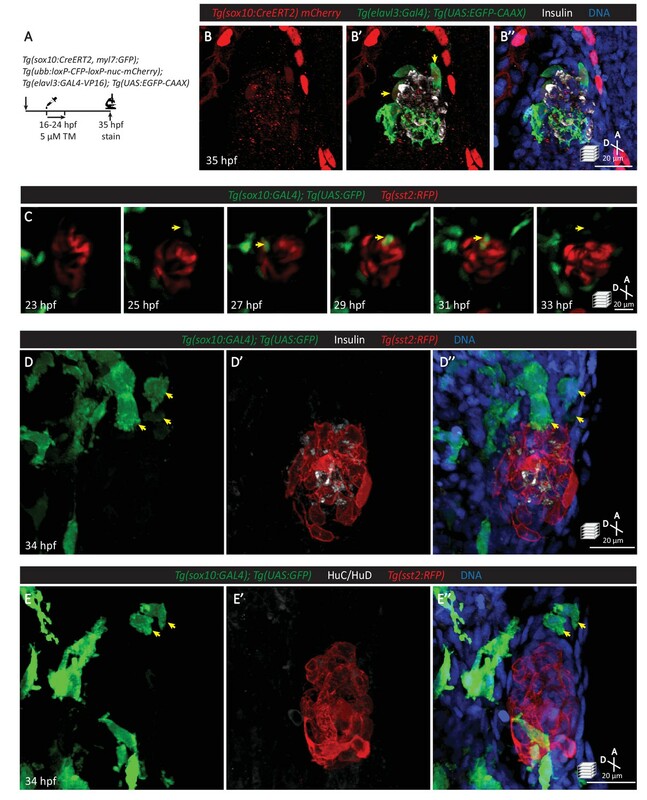 The vasculature is not essential for the initial establishment of islet parasympathetic innervation. (A-B) Whole mount immunostaining of 4 dpf Tg(kdrl:EGFP) wild-type and cloche mutants, which lack most endothelial cells, for GFP (blood vessels), acetylated Tubulin (nerves), Insulin (beta cells), and DAPI (DNA). No significant differences are observed in islet innervation between wild-type and cloche mutant larvae. Inhibition of synaptic transmission results in delta cell hypertrophy. 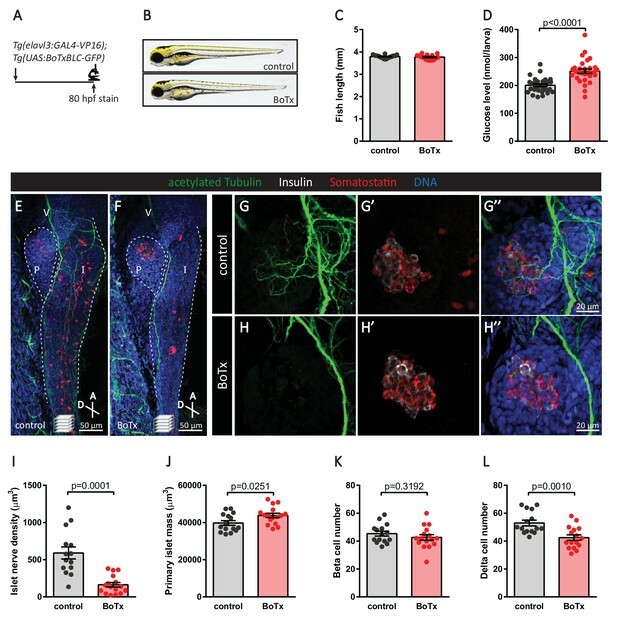 (A) Botulinum toxin (BoTx) was expressed in post-mitotic neurons to inhibit neurotransmitter release in Tg(elavl3:Gal4-VP16); Tg(UAS:BoTxBLC-GFP); Tg(sst2:RFP) zebrafish. (B) Quantification of delta cell volume at 80 hpf, 5–95 percentile box plot, n = 10 animals/230 cells for control, n = 11 animals/236 cells for BoTx. Diminished nerve density and impaired neural output result in hyperglycemia. (A) Whole larva free glucose level measurements of wild-type and sox10-/- zebrafish at 80 hpf and 5 dpf, mean ± SEM, n = 8–22 batches of five larvae per replicate. 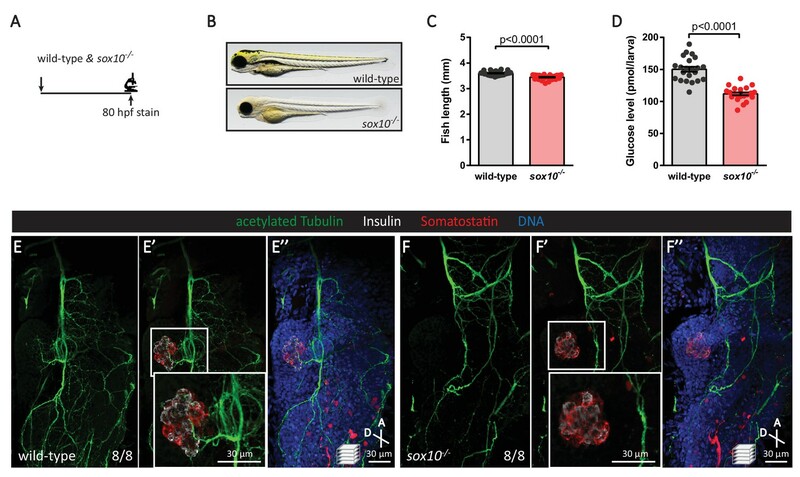 Elevated free glucose levels were observed in sox10 mutants at 5 dpf. (B) Whole larva free glucose level measurements of control and Tg(elavl3:Gal4-VP16); Tg(UAS:BoTxBLC-GFP) zebrafish at 80 hpf, 4 dpf and 5 dpf, mean ± SEM, n = 8–30 batches of 5 larvae per replicate, p-values from t tests are presented. Elevated free glucose levels were observed in botulinum-toxin-positive fish from 80 hpf onwards. 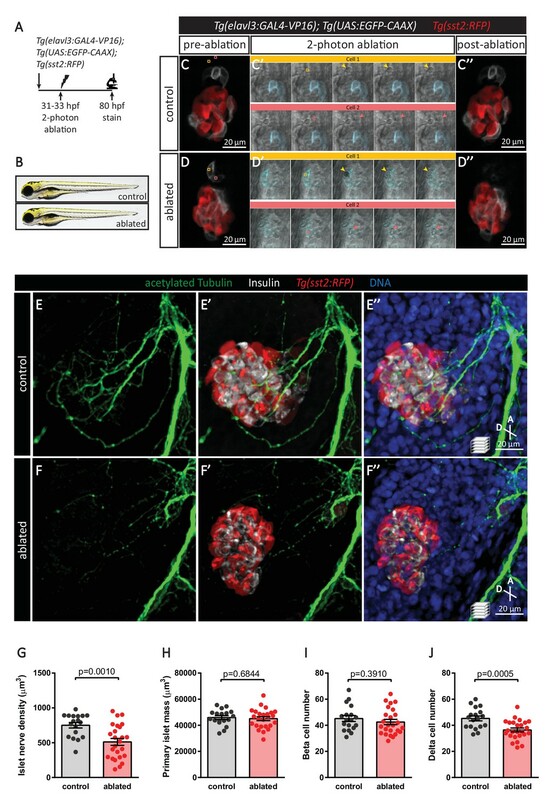 Genetic ablation of neurons decreases pancreatic endocrine cell numbers. 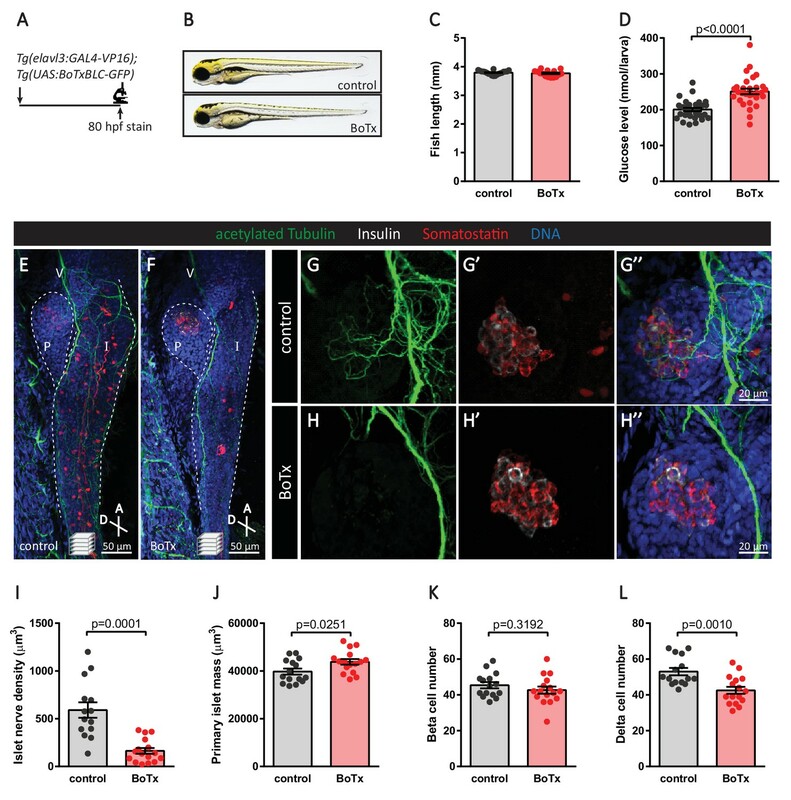 (A) Genetic ablation in Tg(elavl3:Gal4-VP16); Tg(UAS:NTR-mCherry) zebrafish expressing nitroreductase (NTR) in post-mitotic neurons. 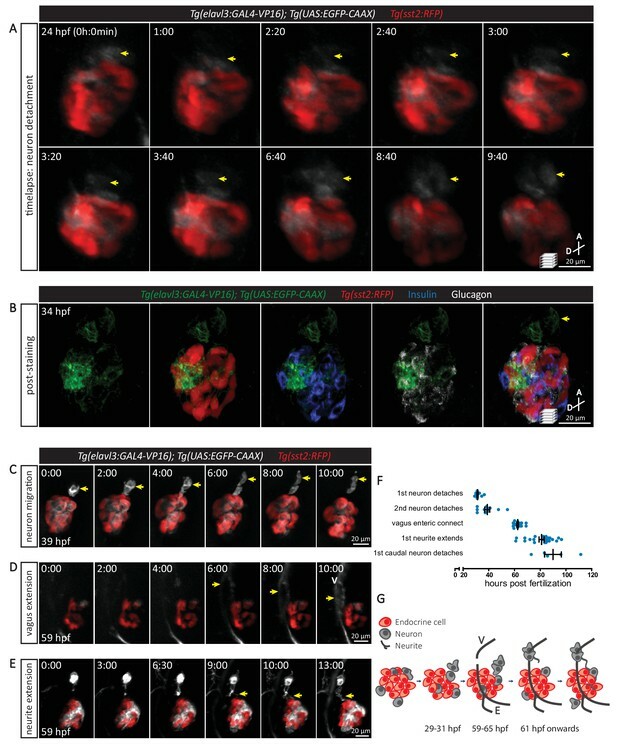 Treatment with 2 mM metronidazole (MTZ) from 24 to 80 hpf triggers cell death in NTR expressing cells. Whole mount immunostaining at 80 hpf for Insulin (beta cells), Somatostatin (delta cells), and DAPI (DNA). (B–D) Quantification of primary islet mass (B), beta cell number (C), and delta cell number (D), mean ± SEM, n = 9–11 animals, p-values from t tests are presented. All data generated/analysed during this study are included in the manuscript. Individual replicates along with the means +/- SEM are plotted for all numerical data in the figures.